Public and private health care providers require walkways that are safe, reliable, and visually attractive. StoneSet achieves these goals while also being completely customizable and environmentally friendly. StoneSet meets accessibility standards. It is safe for wheelchairs. It also makes navigation of hospital grounds safer for medicated patients and the elderly, who have a greater risk for falls. 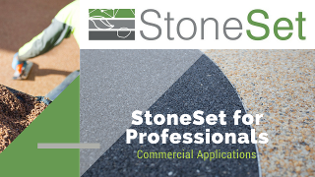 StoneSet is porous, allowing water to penetrate the surface and flow into the ground, reducing pools and puddles of water, leading to greater aesthetics and fewer accidents. StoneSet is also trip hazard free, which is a great concern to hospitals. Falls lead to over 110,000 hospital admissions every year, leading to a true need for safe walking surfaces in the large publicly accessible areas of hospitals. StoneSet is ideal for hospital courtyards; sound vibration is softened in closed spaces. It is also appropriate for large, heavily trafficked areas and makes lovely tree surrounds. It is a beautiful, eco-friendly product and patients who are environmentally conscious will appreciate the green composition of StoneSet. StoneSet meets its goals to minimize waste and prevent pollution. StoneSet’s materials include recycled, and locally sourced stone and glass. StoneSet is quickly installed, and so creates minimal disruption to faculty, patients and visiting loved ones. StoneSet uses no water during the installation process, lessening waste and pollution further. Trash and cement bits are not washed away with water, which would end up in lakes or the ocean, as is the case when installing cement pavement. StoneSet creates a seamless, timeless look that is perfect for hospitals walkways, clinics, nursing homes and infirmaries while protecting staff and patients from slick conditions.